Preview | THERMO Spoken Here! Section 1: Uses high school math, geometry, algebra, and mensuration leading to kinematics, then to physics of mechanics, dynamics, and in some cases, basics of calculus. You have studied these topics. Browse through some cases! Physics and engineer­ing ad­dress the physical world with the goal of understanding and possibly manipulating reality. However, studies and learning about the real world are restricted, generally, to intense study of books. In effect, early learning about physical reality happens via books - a highly vicarious relation to reality, as it were. The goal of Engineering Thermodynamics is to "explain" events of physical reality and to predict the future. Thermodynamics is the study of systems and how systems change with energy interactions. Some knowledge groups supporting engineering thermodynamics are physics, mathematics, vectors, calculus, mechanics, language, and other engineering types. The scope of imformation involved is vast. Its developmenmt has followed a myriad of paths. Also there is no path to follow, to travel retrospectively, to get at the roots or initiation of any topic. Our studies are very much "in the middle." However a "logic of approach" has evolved. "Where is something" is a question persons have asked over all of time. The answer tells the "position of that something" in a mutually understood space. The "something" might be your car keys or a location such as a freeway exit or the rest room, etc. For a person to answer, "Where is it?," requires both familiarity of both persons with the surrounding space. The space "it is in" must be mutually known. The behaviors of masses of real systems are complex. It is virtually always necessary to simplify the system mass. Also it is expedient to engage the simplest calculations; the numbers gotten, though wrong, aid greatly in understanding and how to upgrade the analysis. Very many models of matter are used in analysis of physical reality. It is worthwhile to assume there is some position, some place in the space of the universe that is not moving. A location that stays precisely where it is. No one can prove there is no such location. We assume there is. Consider the position of a BODY that moves in 0XYZ - space. At a time (no time specifically but a time, t = t*) an implicit mathematical statement of that position is P(t*) (below left). space described by the coordinates, 0XYZ. in the space described by coordinates, 0XYZ. Our interest is motion of the BODY until a time later, the inspecific time, t = t* + Δt where the notation Δt is called "an increment in time." By symbol, the position of the BODY at the later time is written (above right). Although Newton studied physical reality, he studied "simplified" to the vantage of a model. The system of Newton's studies was a constant physical mass, the BODY. It is unlikely that Newton expressed the constancy of the mass as a first order differential equation. Here we do just that. Not to be fancy but to set a sound beginning for the property equations that will be developed. Therefore we write the mass equation of a BODY with in its equivalent mathematical forms. Axiom II: The quantity of motion is the measure of the same, arising from its velocity and quantity of matter, (mass) conjointly. To explain "motion of a BODY," Newton invented the derivative of calculus and with that a special spatial characteristic of a BODY; its velocity. With those ideas as basis, Newton postulated a second axiom. Axiom II:  Quantity of Motion of a BODY is defined to be the measure of the same, arising from its velocity and (quantity of matter) mass conjointly. HS text forms of Newton's Second Law of Motion. mV. Newton used calculus to develop a single description of motion of a BODY in space. Today his First and Second Law are aptly expressed by a single differential equation. To say the momentum of a BODY is constant is to say "at the initial instant of observation" the BODY had a certain velocity which it continued to have thereafter. Since the mass of a BODY is constant, its momentum, mV,  is constant provided its velocity is constant. For constant, non-zero velocity, the event of the BODY is said to be "uniform motion." The special (sometimes called "trivial") case is the BODY with initial velocity (and thereafter) equal to zero,  The BODY is said to be at "rest." Of calculus, at this level, we need know only the definition and meaning of Newton's derivative. Physical laws for thermodynamics are expressed as first order ordinary differential equations. Presented below is a simple, time-dependent first order differential equation with its initial condition. We solve the differential equation then we show (in reverse) the differential equation that belongs to our solution. This is the differential equation we solved in the first place, of course. Newton postulated that all masses experience forces as a consequence of the Earth mass. He called this phenomenon, gravity. Gravity forces which act on all parts of mass of a system are directed toward Earth. The magnitude of the Earth gravity force was postulated by the equation. The challenge was to make this force measurable or quantitative. The phenomenon of mutual attraction between masses and the very great mass of Earth is called "gravity." Newton recognized that a gravity force acted on every system (BODY) as a consequence of its mass. The magnitude of the gravity force equals the "weight" of the BODY. Hence "weighing" or to weigh a BODY is to measure the magnitude of the attractive force of Earth. Typical vectors for a BODY (as system) are its spatial properties: position and velocity (also acceleration). The gravity force and sum of surface (or external) forces, ΣF, are vectors. The figure shows a BODY in 0XZ-space with a notation for its vectors. Some say position and velocity are system "characteristics," not properties. It is helpful to use simple but effective vector notations with beginning mechanics and thermodynamic analyses. The table presents some representations of position and velocity (of a BODY or a Point). Science uses mathe­matics to describe events of physical reality in time. Here is discussed "function of time." Newton viewed reality and its mathematical description to be the same in the limit of very change, short  instances in time. At an instance, say at t = t*, physical reality described by a mathematical function has a value, a change of that value (function slope) and a curvature. Value, slope and curvature, that mathematics, explains, physical behaviors at their basis. This simple proof leads to the idea “dummy variable”. Time is relevent to every physical analysis. The basic characteristics of of motion are position, velocity and acceleration. It is inportant, given any of the three, to integrate ofr differentialt (as the case might be) to obtain teither of the other two. Of course the relations are sound. But the calculus can get a little sticky. This partial review of basic, definitional, calculus. The attention of physics and engineering texts to the purported "significance" of the variation of Earth's gravity with altitude is exaggerated. Those text problems ignore the inconsequentiality the effect has for the overwhelming majority of events of engineering systems. Time, perhaps the most grand of all abstracts, attends all thermodynamic events (processes) but it is not a property of any system. Time is easily made quantitative on a relative scale. It is helpful to think that time has a timekeeper with a "clock." By "starting a clock" (initiating its first sequence of periodic events) then counting those repeating, we use clocks to establish what happened first, second, thereafter and so on. Time does not participate in events, it is an observer. But "time" as science uses the idea, is not a casual observer. The "time" of science is a "batch" perspective. In solving problems, drawing sketches and in reading texts, one must be on the guard against carelessness. One critically important error to avoid is omission of forces. It is better to use the notation ΣF rather than F. The summation sign is a reminder to include ALL forces relevant to the physical situation. Students and (authors) who use simply F or f for forces tend to omit relevant forces more often than those who use the notation: ΣF. Newton's axiomatic approach and his Laws of Motion, as taught in HS physics, might be said to be the beginning of the scientific method. However, to proceed to to a full usage of Newton's ideas it is helpful to cast his law, "f = mA," in new perspective. Newton's Laws of Motion are vector differential equations. The most common coordinate system used for their expression is Cartesian coordinates (OXYZ) with origin at the surface of spherical Earth and the positive Z-axis vertical upward. This space has three two-dimensional subspaces, OXY (with Z-symmetry), OXZ (with Y-symmetry) and OYZ (with X-symmetry). For the purposes of study the perspectives "OXZ" or "OYZ" are alike: gravity acts in the Z-coordinate. Interestingly, when one views physical reality and occurrence choosing the horizontal, OXY, two-dimensional plane, gravity is excluded. Motion of a BODY at constant speed constrained by forces to follow a circular path is kinematically described by the radius of the circle and vectors that depict its position, P(t), velocity, V(t), and acceleration, A(t). The grandest abstract of thermodynamics is the universe which is defined to be all that exists in a physical sense. Everything that happens, happens inside the universe. Being infinitely vast, the universe extends well beyond the range or the localized volume of our engineering systems and events. Physical events of importance to human life occur in vanishingly small spaces in the universe. The impossibility of dealing with the entirety of the universe mandates a system approach. To write a summary of Newton's approach and to include the extensions of his work made to this day is a lofty goal of writing. Stated otherwise, "What Newton said and where we are as a consequence" is not a light topic. But we give it a try. The ideal fluid is a frictionless liquid or gas. Properties are mass, volume, density, pressure and temperature. Consequences of Newton's 2nd Law are called "hydrostatics." The hydrostatic equation is a first order equation. The Ideal Gas Equation is introduced. Of the behaviors of phases of matter, fluids (as the Greeks classified liquids and gases) have been the most difficult to describe. An early approximation of fluid behavior (in disregard of fact) was to ignore that flowing fluid matter experiences friction. physical reality modeled as a BODY. In 1687 Newton published two axiomatic statements, three Laws of Motion and much else. His first axiom stated the obvious existence of measurable mass. A properly installed barometer can be used with the hydrostatic equation to quantify the pressure of the atmosphere. With the barometer, according to Torricelli's discovery, the pressure in the void above mercury is zero (the first quantified pressure). We let the hydrostatic principle start "in the void" and be applied along a path downward through liquid mercury to the atmosphere (at zero elevation and sea level). Thus the magnitude of term (1) (previous page) is zero and the result of the calculation will be the pressure of the atmosphere. Consider the simple physical scenario of an expanse of air (a fluid) that exists above the Earth surface. Locations within the fluid have the properties position, temperature, density and pressure. An equation that relates there properties has been derived using Newton's method of system analysis. Below that derivation is presented and explained. Without loss of generality, let the fluid be atmospheric air. 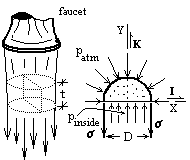 The mathematics of the hydrostatic equation is that the Momentum Equation (Newton's Second Law of Motion) applied to a small "element" of static fluid. Static does not mean "not moving." It means "not disturbed." It means the sum of forces equals zero. The sum of forces are zero with no motion and with uniform motion. In most cases the path used for pressure determination is obliged to cross (at least one) fluid interface. On one side of an interface there is say "Fluid A" while on the other side exists "Fluid B." How does pressure change as a consequence of passing through an interface, as from "Fluid A" to "Fluids B?" It will not be proved here, but if the interface is flat, there is no pressure change. However, for spherical droplets in air and for the very small diameter jets of water (as with of cutting machines) in air, the pressure of water inside its substantially greater than atmospheric. Consider water that issues downward from a faucet. Terms of pressure technology can confuse the beginner. Clarification of the many terms is made certain by concentration on the fact: pressure belongs to a fluid at a point. The numerical values of pressure of any fluid are not read on the faces of gages. The readings of gages are not pressures; they are indicators of the pressure at a location within a fluid. A brief explanation of how the ideal gas equation was developed (about 250 years ago) is helpful in learning to use it. Studies of typical solids and liquids (the condensed phases) showed their densities to be inconsequentially influenced by changes of pressure and/or temperature. But for gases, every condition not standard exhibits a different density. Concurrent with studies of gases were development of temperature scales and thermometers. More substances are not ideal gases than are. Thus the ideal gas equation can be used ONLY "after the gas has been shown to have ideal behavior" or "by assumption that the equation applies." Is water at STP an ideal gas? Section 3: Newton created the construct, FORCE, as the cause of motion. The matter in question was modeled to the simplest extent, to be a BODY. Thus mass of a BODY and Force were beginning ideas about events of mass, i.e., about its motion - its basic activity. Today, meaningful understanding of motion requires math at a vectors and calculus level. If you don't like math - not to worry. Someone else will understand this physics and tell you about it. So let's begin... What is work and energy will be told in due time. By previous studies we know Newton's Laws of Motion provide a valuable means of understanding motion. In the 60-90 years after his death, scholars extended the utility of the 2nd Law. Though this extension can be told in a casual way, physics or engineering applications require a quantitative development. Mathematical extension of the 2nd Law statement begins regarding the rate of change of momentum of a BODY under action of forces. Newton's 2nd Law is "extended" simply. Consider that the BODY is displaced. Multiply Newton's 2nd Law by that displacement. Newton's 2'nd Law of Motion (a mathematical expression) that tells the change of momentum in time provided the initial state of the BODY and the forces acting on that BODY for the duration are known. Since his death, scientists have tinkered with his Law of Motion. Two new ideas useful in understanding physical behaviors of a BODY have been determined. These new ideas are the constructs: Energy and Work. The idea Potential Energy was constructed to be a new and useful perspective for the understanding (and study) of physical reality. One point needs to be made clear. When the idea "potential energy" is NOT used, the perspective of behavior of a BODY is the Understanding of by which (will abiding the full scope of Newton's Laws) the work of an event of a BODY associated with "gravity force" is recast. This subtle idea requires. Work is the displacement of a force through a distance. Work is defined by physics, by engineering and elsewhere in our language. Work is a term of physics, thermodynamics and other usages as, say, "Let's go to work." Work happens by a force and its displacement. It is by "work" that energy is made quantitative. Work is not energy. Nothing possesses work. Energy has a "place." Work also has a "place" spoken of as the "to" (or the "from"). 3.05 Work as "done on" or "done by"
More to be written here! Every engineering analysis or experiment has a "system" as its focus. System is a theoretical idea patterned after the work of Isaac Newton. The subject of every consideration of thermodynamics is a specific, initially selected amount of matter called the system . System definition is a matter of both selection and isolation. The previous derivation of the energy equation for a BODY (sometimes called the "extrinsic energy equation") was accomplished mathematically without reference to anything specifically physical. Below we will derive the same equation but do so in reference to the physical events of a forklift. Energy principles (though not always in the context of an energy equation) are introduced in beginning physics. Newton's Second Law of Motion described "change of momentum" of a BODY in consequence of action of a sum of forces. Another perspective of such events, a perspective that introduces the construct, energy, can be developed. When a positive change of momentum of a BODY is multiplied by its positive displacement with that change, a change of "energy" of the BODY is said to have occurred as a consequence of an energy "transfer" mechanism; "work." Newton's models of physical reality were the BODY, two BODIES and the EXTENDED BODY. These system models worked very well for planetary motion and for simple, low-friction, events of solids on Earth. The simplicity of there being but two types of energy, kinetic energy and potential, and the fact that their sum was (nearly) always constant, supported the common idea, "energy is conserved." The trend of study of energy these days is less-so "energy is conserved," and more-so "How does energy change." Compression work will be introduced as occurring to a gas (many bodies as a collective system) contained in a horizontal piston and cylinder apparatus which is idealized to function without leakage or friction. By action of the assumed frictionless mechanical crank and gear, the piston is advanced a differential distance into the cylinder. With the crank, piston and gas as system The force-displacement of the crank is work delivered to it. With compression of the gas, it is obvious there is work but the apparatus is arranged so the gas experiences zero kinetic energy change and zero potential energy change. The general ideas of internal energy and compression of a substance arrive early in science education. Our goal is to give form to those ideas and a representation for them suitable for a thermodynamic energy equation. Our extrinsic equation addressed system displacement, kinetic and potential energies. Our immediate task is to identify and explain internal energy and compression work which are associated not with system displacement but with its deformation. The system of this develop­ment is an Ideal Gas (IG). The IG, having its simple Equation of State, permits the math to go smoothly. There are two idealizations of the event - frictionles ans adiabatic. Our path is to introduce internal energy and enthalpy in a general manner, simply as properties, then to discuss how they apply to physical events or processes. Entropy is a thermodynamic property of the system (substance) and of the surroundings. "Entropy of Everything" is the subject of a physical law; the Second Law of Thermodynamics. Everything is the Universe has the parts: system and surroundings. Science students are physically aware of temperature and the associated event, heat. When heat and temperature are being considered, the model BODY or point mass is inadequate. The new model is SUBSTANCE (or material (metal, solid and so). Also a new energy form is introduced: internal energy. While every thermodynamicist uses only one sign convention, it might not be the same as another uses. The clearest way to state your sign convention is by a quick sketch. Which, of the sign conventions shown, if any, is wrong and why? is not indicated. Therefore “(3)” is wrong by omission. Previous pages presented definitions and assembled an energy equation relating interactions of system energy, work and heat. The table serves as a way to take stock of the Energy Equation we have and how it was obtained. Our goal is a complete, competent Energy Equation. So far we have the simplest external (extrinsic) energy equation in which energy changes and work relate directly to displacement of the body (system). Many physical gases of systems qualify as being "ideal" in their events because their properties pressure, temperature and specific volume conform to the ideal gas equation. In those states, the specific heats of gases depend solely on temperature (are independent of pressure). How to check, using property information, whether (and over what ranges) pv = (R/M)T is valid is an important and easy task but is special topic. The simplest model of physical matter is the BODY which is an approximation of the selected matter as being localized at a point, that is, to have mass but no extent. For mass without extent, rotation makes no sense. Otherwise stated, a BODY does not rotate. Frequently in engineering one is required to evaluate an integral (or double integral). Students, having just learned calculus, tend to belabor such tasks. To obtain a quick answer, simply assume you know the constant, average value of the integrand over the range, then apply the MVT. The principles of thermodynamics can be expressed in either of three distinct mathematical formats. The differential format is used to develop equations and for derivation of special results. Time is not a factor with differential considerations. That work passes through shafts of machines is obvious. Yet a thermodynamic discussion is worthwhile. Consider a machine that has a power shaft but which is off, inoperative (top view). 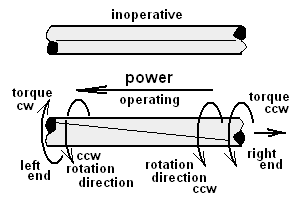 While the shaft is inoperative (not rotating) press a sharp-edged bar of steel against the shaft and draw it from one end to the other thereby leaving a scribed line the length of the shaft (shown as "inoperative"). Section 5: Previous sections have addressed the tools of thermodynamic analysis. The attempt here is to treat every thermodynamic consideration with a consistent method. THERMO Spoken Here! was written to teach the method of thermodynamic analysis. The systems of engineering analysis (mechanical systems, electrical, thermal and all others) consist of matter. Events of matter (as an event in action, an event anticipated or some event observed) are marked by the change (or non-change) of some (or none) of the system physical properties. There are many physical properties. Basic thermodynamics addresses the three basic properties: mass, momentum and energy. All engineering systems consist of matter the simplest property of which is mass. There is a general equation that "accounts" for system mass and all manners of its behavior (the system being correctly specified, of course). Logically we name that system equation after its property, the Mass Equation. The Mass Equation is an implicit, first order, differential equation with system mass as the dependent variable and time as the independent variable. This form is often called the rate-form. The equation has two types of terms, each potentially time dependent. System is a mental construct, in each case it is an selected perspective, that is a biased approach. System is something in your head - not real. System incorporates the aspects of reality the user, the observer believes important. "What, precisely, is the system? What is relevant to the "system events," and how is it relevant?" There is rarely agreement. And when there is agreement; it is for trivial, called "classical" situations. 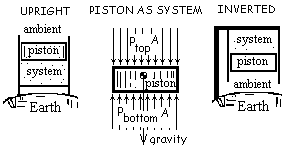 Beginning level systems of physics and mechanics are typically some solid, or statically constrained liquid or gas. Motions of systems that are, and remain solid or constrained, are easier studies than are motions of liquids and gases in general. Here, beginning with that simple vantage of matter, a technique of calculus is explained later to be used to describe more complicated motion of matter - motion of liquids and gases. When mass is selected (as a specific quantity and identity) that mass occupies space. The mass has what is called a "material boundary." One perspective of "conservation of mass," is that... more later! is Mass is conserved in a "material" perspective in "its" material space, meaning "the space of it (it being the original and constant identities) for all time and change. Mass stays in the space it occupies until physics decides it should move to occupy its next space - conserved in such events is a loose idea of "conserved." The model BODY is useful but limited. Thermodynamic systems don't just displace; they deform, grow, contract and flow. Extension of Newton's Second Law of Motion is our objective. When mass enters a system, it does so with a velocity, hence as mass enters, so also does momentum. It stands to reason a system equation admitting momentum crossing the system boundary would have momentum transfer terms. The mass equation and momentum equation are used together for systems with flowing mass. Vector multiplication of Newton's 2'nd Law (with a BODY as system) produced the first and simplest energy equation. Two forms of energy were identified and specified in terms of mass and the outwardly observable properties position, displacement and velocity. Work and/or equilibration were recognized as mechanisms of energy change. The basic energy equation was extended to apply to a substance (collection of Bodies). Here we review the basic equations then extend the equation to apply to a fluid that flows and might experience temperature change.